Are you confused? Smoothies used to seem so easy! Then the green smoothie was introduced. And coconut water. And collagen. Yet these superfoods may not be all that they're cracked up to be. So what's the truth? What makes a smoothie a truly healthy snack? Here's how to make a healthy smoothie — some easy DOs and DON'Ts to make your smoothies nourishing, beyond any doubt. Note: though this is a list of dos and don'ts, please don't feel the burden to make perfect smoothies. There's plenty of room for doing the best you can while creating a smoothie you enjoy eating! For a no-fail healthy smoothie whenever the mood hits, follow this list of DON'Ts! Don't #1 — Don't use raw kale or raw spinach in your green smoothies. Kale belongs to the cruciferous family and is hard to digest unless cooked first. It also suppresses the thyroid. Read more about oxalates here and here, Why We Steam Kale (and other dark, leafy greens). Don't #2 — Don't use store-bought fruit juice in smoothies. When juices sit overnight, they turn to fructose and their living enzymes die. Not to mention, pasteurized juices don't have any living enzymes to begin with. Store-bought fruit juices are essentially liquid sugar with zero nutrition. Don't #3 — Don't use canned coconut water. Coconut water is the height of foodie fashion these days. Yet, if it's canned, refrigerated, and not fresh, its living enzymes have expired. It doesn't have any nutrition left. Yes, it may contain moderate amounts of potassium — but this electrolyte comes packaged in a high-sugar base. Is that worth it? Coconut water may seem low in sugar, but because it's 55% fructose, it actually contains 6 grams of sugar in every cup (source). Don't #4 — Don't use proteins powders, EXCEPT sparingly or purposefully. Few protein powders are comprised of whole foods. Rather, they contain hard-to-assimilate food components. At the end of the day, our bodies benefit most from whole foods and not from food extracts with seemingly beneficial nutritional qualities. What about whole food protein powders like those made from hemp seeds only? These are fine in moderation. Hemp seeds have a decent omega-3 to omega-6 fatty acid profile. I personally enjoy hemp seeds weekly at most — not daily. What about non-denatured protein powder such as this Vital Whey protein powder that Wardee recommends? This is a good choice as well. And certainly an argument can be made that some people could use a protein boost. If they have higher protein needs (such as body-building or pregnancy) than a nourishing whole food diet provides, by all means, use it. Animal protein is the best source of protein. Nuts and seeds should be eaten in moderation. …unless they are high-temperature roasted, and as an occasional treat because you love the flavor. According to sources like Chris Kresser, raw unfermented cocoa beans are extremely high in phytic acid. Phytic acid binds to other minerals in your smoothie and prevents their absorption. Cacao beans must be harvested, fermented, dried, cracked, deshelled, and sometimes roasted to get cacao nibs (source). Both fermentation and roasting reduce the levels of phytic acid. High-temperature roasting is preferable because it kills any fungi present on the beans, and reduces the phytic acid even more. If you are truly concerned about phytic acid, you may want to avoid cacao in your diet. Don't #6 — Don't add whole raw eggs or egg whites. The egg white protein, called albumen, is hard to digest and is best eaten cooked only. For a no-fail healthy smoothie whenever the mood hits, follow this list of DOs! Do #1 — Do seek out greens — just not in the form of raw kale or spinach. Instead, use safely sourced spirulina. It's an easy-to-use powder that is abundantly rich in minerals, amino acids, fatty acids, and chlorophyll. To get the right boost without overpowering the flavor of other ingredients, use 1 teaspoon spirulina per 16 ounces of smoothie. Do #2 — Do add cooked leafy greens to your smoothies. Briefly steam spinach or kale and then freeze in ice cube trays. Place 1 to 3 ice cubes in every smoothie for the benefits of leafy greens without the risks of oxalates and raw cruciferous vegetables. Another option is to create your own green powder from steamed greens, as described here. Yes, it's homemade nourishing green powder! Do #3 — Do add fresh herbs to smoothies. Herbs like fresh basil and tarragon add exciting flavor and a bit of leafy green nutrition to your smoothies. Watch out for certain herbs like parsley, though, which are still quite high in oxalates and best eaten in small amounts or lightly cooked. Do #4 — Do use fresh juices in your smoothies. If you have a juicer and don't mind the extra step, fresh juice has many benefits! It is full of living enzymes, helps with detoxification, and is an excellent way to add foods like ginger and carrots to your smoothie. Do #5 — Do add flax seeds — at the right time. Because it is estrogenic, flax is best consumed during the first half of a woman's cycle. Additionally, flax does not convert well into the fatty acids our bodies require (EPA and DHA). It is also high in phytic acid, so it can rob our bodies of minerals. Read more about the cautions and benefits of flax here. Do #6 — Do use the water from a fresh, young, Thai coconut. Add both the meat and water to a smoothie and provide yourself with a plethora of living enzymes. Or harvest the fresh coconut water and ferment it yourself! Do #7 — Do add avocado to your smoothies. Absolutely! They're high in mono-unsaturated fats and loaded with nutrition. They make smoothies creamy and provide a great base for even dairy-free milkshakes. For some exciting flavor options, avocados pair wonderfully with fresh mint or mint oil, frozen berries, and fresh lime. Do #8 — Do add whole food vitamin C powders. Find powders sourced from whole ground berries such as amla, camu camu, and acerola. I recommend both this powder (which contains all three mentioned berries), and this one (which contains only amla). Do #9 — Do add chia seeds for an extra boost. Chia seeds need no soaking, are easy to digest, and provide a convenient source of energy. They're also high in good fats, calcium, and magnesium. Plus, chia seeds are high fiber so they're really good for digestive regularity! Do #10 — Do add raw egg yolks. They are an excellent source of brain-healthy cholesterol, with fat that's easy to digest! Do #11 — Do add Kombucha or Jun as the liquid base to your smoothie. These bubbly probiotic beverages, made cheaply at home, are a great way to add a little zing and nutrition to your treat. Do #12 — Do add collagen and gelatin to your smoothie, and make sure to balance amino acids, too. Collagen and gelatin are great sources of nonessential amino acids (see here for my post about gelatin's benefits). However, they are also deficient in many of the essential amino acids — the ones our bodies can't make by themselves (source). We rely on food to provide these important building blocks. So, if whipping up a smoothie with collagen for lunch, make sure to nourish your body with meat, milk, or eggs at some point during your day, too! Or add some raw milk, yogurt, or kefir to your smoothie! These foods are rich in essential amino acids (source, source, and source). It's all about striking the proper balance. Here are several more ideas for proteins that work well in smoothies. Also, the major food nutrients work hand-in-hand, so make sure to include both protein and fat in your diet. For instance, the enzyme colipase (a protein) plays a significant role in the digestion of fats in your small intestine (source). Additionally, vitamin K (a fat-soluble vitamin) helps to synthesize blood-clotting proteins. All of the fat-soluble vitamins can be found in raw milk, so consider adding raw cream to your collagen smoothie as well (On Food and Cooking, page 18). Do #13 — Do add raw liver. Liver is one of the most concentrated sources of essential fat-soluble vitamins A and D. And good news! The flavor of the liver is indistinguishable amidst the other ingredients. I find that the best way to add it is to cut the raw liver into small chunks. Purée chunks in blender. Pour purée into ice cube tray and freeze for 2 weeks to kill any potential pathogens. Pull out 1 to 2 cubes for each smoothie. Allow frozen cube(s) to sit at room temperature for 5 minutes. Cut into thin slices, or put whole cubes into blender, depending on how well your blender purees large chunks. Do #14 — Do add tigernut flour. 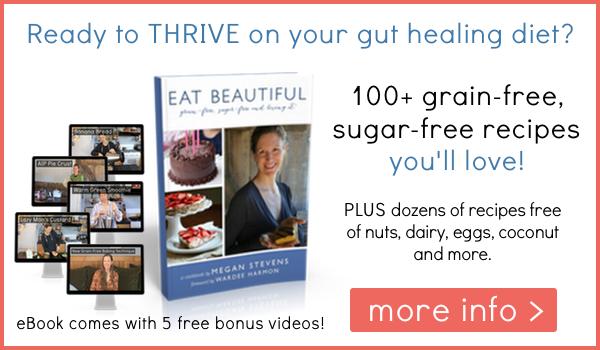 Tigernuts top the charts with their quantity of resistant starch. Add a few tablespoons of flour for a great taste and an easy way to eat RS! Do #15 — Use honey-water or stevia-water as the liquid needed in your smoothie. When you don't have fresh juice or raw milk on hand, honey- or stevia-water make great alternatives. This video includes the honey-water recipe. What about foods like coconut oil and acai berries? They are popular foods in today's smoothie culture, too. It turns out they are healthful, nutrient-dense, and easy to digest for most people. I didn't include them because personally, I like to consider the foods in my heritage. My Russian ancestors ate bone broth, cooked meats and vegetables, sourdough, and fermented foods — so I eat these too. They make me feel well. With the superfood concept prevalent in the American psyche today, sometimes we feel as if we must cram more nutrition into every sip. However, nutrition is different for different individuals. One size does not fit all. Acai berries are great, but you don't have to worry about them if you have locally grown blackberries or blueberries in your freezer! Do your best. It's okay to focus on just a few foods to heal and nourish your body. What are your favorite smoothie add-ins? Do you tend to seek out exotic super foods or keep it simple? What's your favorite smoothie recipe? Ughhh! And I thought I was doing something good for my body! Way too many do’s and don’ts in the health world, I can’t keep up! I’m sorry. I understand. 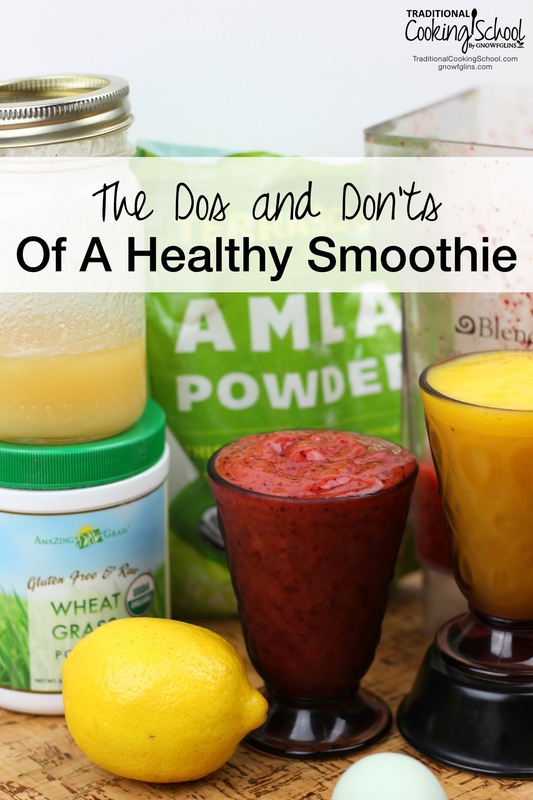 I hope that this quote toward the top of the post is helpful and somewhat comforting: “Note: though this is a list of dos and don’ts, please don’t feel the burden to make perfect smoothies. There’s plenty of room for doing the best you can while creating a smoothie you enjoy eating!” It’s true; eating should bring us pleasure and health, not stress. Yes, thank you, it is comforting. At least I know I’m not adding a lot of sugar since I don’t add fruit juices and the like. At least I think I’m doing more good than bad for my body. I can not get #4 DO to hover. Joyce, are you on a computer or phone/tablet? It’s possible they don’t show up on mobile. No matter what, you can put this link into Facebook or Pinterest: http://traditionalcookingschool.com/2016/04/27/how-to-make-a-healthy-smoothie-dos-donts/ and it should take over from there! Fantastic post, Megan. Thank you!! I appreciate you spreading the word about high oxalates in spinach. You might want to check them in chia seeds. According to my calculations, flax seeds are very low in oxalates with about 0.5 mg per tablespoon. Hemp seeds are medium with over 7 mg per tablespoon. Chia seeds are extremely high with more than 80 mg per tablespoon. Since oxalates bind minerals, chia seeds are not a good source of calcium or magnesium. Chia seeds have about 700 mg of oxalates per 100 g compared to nearly 800 for spinach steamed for 8 minutes and nearly 1150 for raw spinach. I certainly have not read those numbers. I’ll go read a bit more. Thank you for sharing. This makes a whole lot of sense! Thank you for this great article! my smoothie consists of the following [I live in India]. 2. I full tea spoon of pre-prepared “golden elixir” – a mixture of 3 tablespoon of turmeric powder, a quarter tea spoon of black pepper powder and a cup of water simmered for 15 minutes to for a paste and then refrigerated – stays for 2 weeks. 7. 2 tablespoon of home made protein powder from germinated seeds, nuts like cashew etc. Sounds lovely!! Thank you for sharing! And another website says that cooking greens (even steaming) destroys their nutritional benefit! Aaugh. What do you think about wheatgrass as a green for juicing? Yes, wheatgrass is a good choice for juicing. 🙂 I also use a raw wheatgrass powder at times, for convenience. While many sources say that cooking greens destroys their nutrition, those sites are usually advocating for raw nutrition. Traditional cooking values raw and living enzymes, but also looks at the digestibility of foods’ components. Oxalates are being discussed more and more, thankfully, and their link to health complications such as kidney stones. There are certain greens that are nutritious to eat raw; but others are not. Those specifics are discussed to some extent above, in the main article. There is also a link to another article on the subject. If I do not want to juice, can I put raw carrots in my smoothie? Yes, this is called a blended smoothie. I used to do lots of these, and they’re fun. My one caution is to not over-do. It’s easy with blended smoothies to get too many veggies, or too many of the same kind of veggie. I think it’s best to only drink what we’d gladly eat. So 1-2 raw carrots in a smoothie is great; but more than that is too many, in my opinion. Thanks for the great question. How does freezing raw meat kill pathogens? Raw is raw, isn’t it? We still handle thawed chicken, beef, and pork with care and wash all our cutting boards and food prep tools well so we don’t get sick. How many pathogens get frozen for ‘later’ in medical laboratories? Can you explain more? Thanks! Hi Valerie, this information comes from the Weston A. Price Foundation; but also I learned this technique when I was a sushi chef. All raw salmon is frozen for a minimum of 3 weeks, and then can be sold for sushi or as sashimi, as certain kinds of worms and pathogens can not survive the long-term freezing. No salmon sold in the United States as sushi or as sashimi skips this freezing step. I’m sure you’re right: there are certain pathogens that survive the freezing. I have not studied which invasive pathogens are killed vs. which pathogens may survive that are considered benign for human consumption. Thanks for the great question. What about pea protein powder? How does it compare to the other options. And if you dehydrate your raw liver, do you still need to freeze it before consuming it? I have not dehydrated my own liver before, so I don’t know about that. But in regard to pea protein powder, it is not a whole food and may be denatured. It doesn’t come with its co-factors and likely does not assimilate well. Animal protein is best. Designs for Health makes a grass-fed, beef-based protein powder that may be fine, but again, fat must be added in, in my opinion. Thank you for the great questions! Wow! How interesting. I have a Downs Syndrome Blessing that eats a limited number of foods, so years ago, concerned he was not getting enough nutrients, I juiced daily for him (greens, veggies, & fruit). That was a lot of work, especially cleaning the juicer. Then I acquired a Blentec and proceeded to blend his goodies, using lots of greens. He has scolioses, wondering if all of these raw greens contributed to this. So I guess another change is in order. Thank you for this article. Hi Brenda, you’re welcome. I’m glad it was helpful. Such a loving mama!! Aren’t chia seeds estrogenic as well? I have low progesterone and don’t want to eat something that was exacerbate the problem! ? I’m sorry. I do NOT agree with several things in this article. I find it disappointing that you are discouraging the readers in. Consumption of raw greens. I also, whole heartedly disagree that consumption of raw greens attributes to autism. If anything, non nutrient dense foods are the problem. You simply have to go back to the basics. The way we are supposed to eat to nourish our bodies. I really hope that this article did not hinder a person in eating greens!